Check in was pleasant and efficient. That's where it ends, Folks! Facility is geared for long term residents and is not kept up well at all. We had a parking-lot type site, both the TV and Wifi left a lot to be desired. At this point in our travels we had learned what Good Sam advertises is not always what you get! Very difficult to find. The rv park may be hard to find if you do not google it first and take a virtual drive with google maps satellite street view. If you do that, it's a snap. I was tempted to give the park a higher overall rating because it has lots of mature trees and therefore lots of shade in most sites, important in the summer but it's an older park so didn't quite make it. Very large park. Friendly staff. I don't believe we had reservations and still got a spot. The restrooms and showers are clean, but the showers cost I believe 2minutes per Canadian dollar, which I thought was too much and opted to use my trailer shower instead. There is wifi but it's terrible to non-existent, I did not try using it at the office (too early in the trip to be desperate). There is some train noise but no traffic noise. There is a Costco not too far away for gas if you're a member. If you're coming from the USA, the gas prices may be a sticker shock. Despite reasonable ratings by good Sam this park is dated. First, the Wi-Fi does not work anywhere even close to the registration area. Second there are very few Pull-thru spots and even those are small with narrow streets. Utility hook ups are easy to access. Worst of all is access directions on GPS locators since Park access is on that frontage road with a difficult access to the frontage road. Fortunately there are numerous signs after getting off the main highway. Pull through sites are without trees while remainder of Park has numerous trees on the sites. Stayed 1 night. My wife thought that the site that we were put in was the roadway due to the lack of picnic table. The wifi was non-existent. we were told when we checked in that it was spotty in the park. We were later told by another park employee that the wifi on the park had not worked for quite a while and they had not been able to find someone to fix it. the park was full of non-functioning wifi antennas. The location is very difficult to find due to the address being a highway when in fact they are on a service road. Even knowing that, it is confusing to reach even when in sight. Once there the gravel roads are extremely potholed - they do not require speed bumps. In the 1970's when this was probably built it was a nice place. However, it appears that the owners have not invested any money since. For example, the laundry door is left open with no screen door and the bugs are worse inside than outside. The sites are back in and the streets are small. Tow vehicles and even satellite dishes completely encroach on the driving space with no control from management. I would not recommend this, however, alternatives may not be as good. 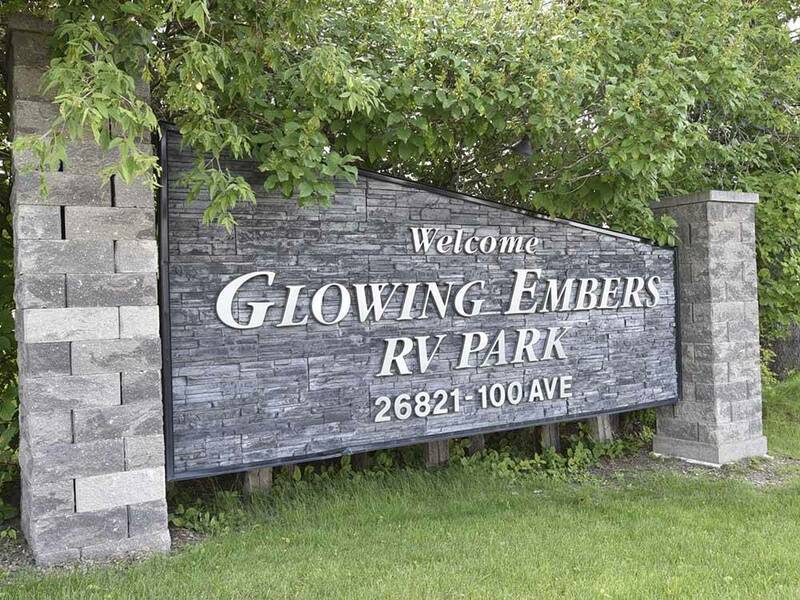 The location for access to the Edmonton mall is the only good thing about Glowing Embers. We occupied a back-in site at the front of the reception building for 6 nights. The staff are all very friendly and extremely helpful. Restrooms are clean and the showers are hot. At the time there was a diversion through an industrial area with on-going building works to reach the site, which was rather confusing. 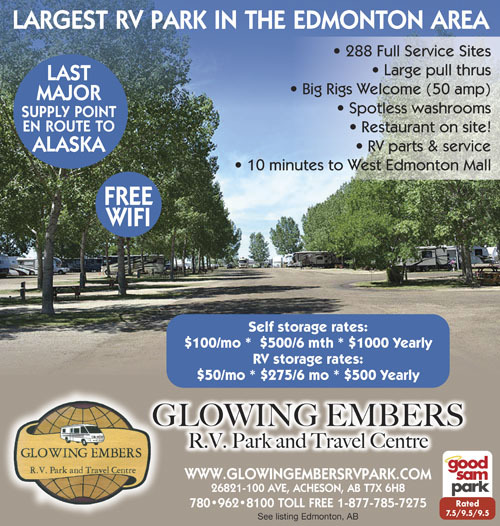 I would recommend the site to anyone staying in Edmonton area. So Much To Do! So Little Time! Stay Longer! Do Everything! Edmonton offers something for everyone; indoor, outdoor, culture, gambling, shopping, amusement & water parks - name it, we have it in abundance. Check out our website Local Attractions or ask our staff for recommendations.